But nobody told.me it was this easy! Yeah…no.pectin..no artificial colouring and you control the sugar that goes into it. cool 😎 right ! This turned out to be my Sunday morning adventure . Let the jam cool then fill it into sterilized jam jars. It can sit in the fridge for about 2 weeks from all the blogs I went through. Enjoy knowing you are in control of how you nourish your body!! Haha enjoy!! This entry was posted in Eating clean, Sweets for my sweet..., Vegetarian and tagged Jam, Strawberries on August 9, 2015 by rheena74. I got this recipe from the BBC Goodfood magazine and the colours were so pretty and the recipe was SO SIMPLE! I love these kind of simple and delicious recipes. Get a deep pot, add some olive oil, about 50ml and throw in the chopped aubergine. Cook on medium heat till slightly softened, about 10 minutes. Take it out and add the sliced onions, cook till softened and slightly caramelised. Now in goes the chopped tomatoes, cook till softened and well incorporated with the onions. Add 3/4 of the sliced celery, capers, raisins and the red wine vinegar. Now add the aubergine back into the pot. Season well. Cook on low heat for about 25 to 30 minutes, mixing gently in between. About 5 minutes before you take it off the heat, add the remaining sliced celery for the crunch. Check seasoning again and serve garnished with pine nuts and basil leaves. Serve with ciabatta. Super yumm! This entry was posted in BBC Goodfood, Vegetarian on July 8, 2015 by rheena74. I’m Indian and I love Indian food. Should I cook more Indian food…well I can if I had more time on my hands. These recipes are so easy to make and hassle free that I just love the simplicity of it. And the ‘ Clean eating’ concept I was talking about previously fits perfectly with my time schedule. 🙂 and so much healthier too…luv it! Go ahead and try it. Heat oil in a large pan, add onions and peppers. Season and cook on medium high heat till just tender and starting to char. Add coriander stems, stir for a minute then add spices. Keep stirring for about 2 mins till fragrant. Add some water if too dry. Tip in the tofu, kidney beans, tomatoes and sugar. Cook for 5 minutes on medium high heat till sauce is quite dry and tofu is heated through. Taste sauce for seasoning and add coriander leaves and some lime juice as needed. Taste again and adjust seasoning if needed. Warm tortillas following pack instructions. Serve with some yoghurt or sour cream, lettuce and avocado wedges. Serves 4, prep 10 mins, cook 15 mins. This entry was posted in BBC Goodfood, Vegetarian on June 30, 2015 by rheena74. This is so yumms that you’re gonna love it! It’s part of my ‘Eating clean’ concept. When BBC Goodfood sent me this recipe, I literally jumped up and went to the kitchen to make it. It didn’t take much time except for the tossing and turning the granola in the oven from time to time. 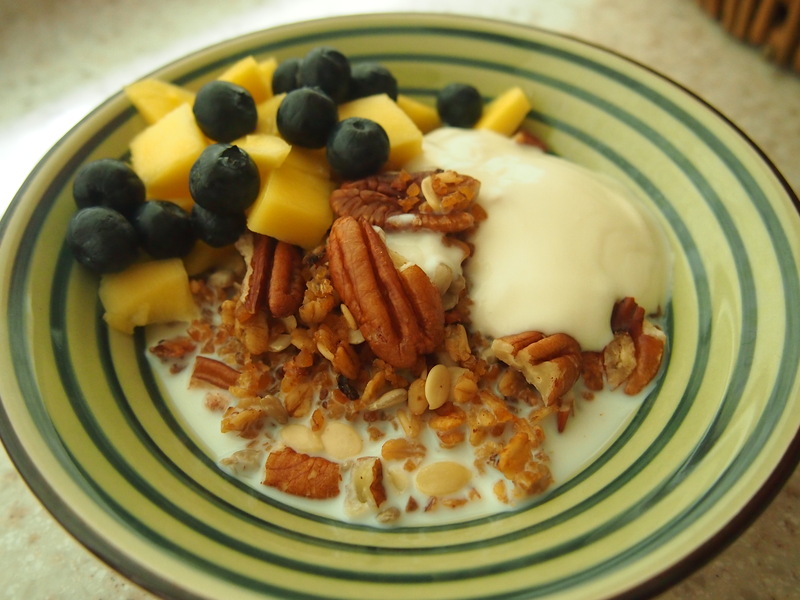 End result…yummilicious homemade granola! Soak buckwheat overnight in cold water. (I actually used bulgur wheat and soaked for just an hour) .The next day, drain and rinse it. Put the dates in a small pot with 300ml of water and the ground cinnamon and blitz with a hand held blender or just put in into a blender and blitz it till smooth. Then add the buckwheat (or bulgur wheat ) and cook it for about 10 minutes till pulpy. At the same time, preheat the oven to 150deg C/ gas 2/130C fan . Take 2 trays and line with baking parchment paper. Stir the oil and oats into the buckwheat mixture and mix well. Now take spoonfuls and spread onto the baking trays in clumps. Bake for 15 minutes, then remove from oven, slowly turn it over and bake for another 15 mins. Keep doing this till it becomes golden and firm. I did this for about another 20 minutes, turning and mixing in between. Then take out of the oven, let it cool and fill it into a clean, dry jar. Mix into it the sunflower seeds, pumpkin seeds, flaked almonds, pecans and sultanas. Wallah homemade granola! Serve it with milk and some fruits, or some greek yoghurt and fruits. Delish!! This entry was posted in Eating clean, Vegetarian and tagged almonds, buck wheat, bulgur wheat, granola, pecans, pumpkin seeds, sunflower seeds, yoghurt on June 13, 2015 by rheena74. Palak paneer………..always brings back memories of medical college, studying in India. We don’t get such delicious food in the mess ( canteen) , so we go out, a bunch of us once in 2 months perhaps and we always end up ordering North Indian dishes when we go out. And 20 years ago there weren’t that many hotels in Pondicherry, so we always ended at one of the 2 decent hotels in Pondy and ALWAYS end up ordering Palak Paneer! or Paneer butter masala with butter naan….hahaha doctors..so predictable! Anyway, my son loves palak paneer and I believe the recipe is quite perfect but I’ve tweaked it a little to suit my taste. Boil some water in big pan, once it’s at a rolling boil, throw in the cleaned spinach. Blanch it for about 2-3 minutes. Remove and let cool on a plate, then puree fine in a blender. Throw out the water from the pan, heat up on medium flame and add 2 tbsp. of vegetable oil or ghee. Add the cumin powder/ cumin , let sizzle for 5 seconds then add the chopped onions, green chilly and fry till golden brown. Then add coriander , chilli and turmeric powders. Fry for about 30 seconds. Now add the ginger garlic paste ( which I usually grate directly into the pan) 😉 ( lazy). Fry it for about a minute then add the tomato paste, mix well. Now add the pureed spinach followed by the cup of milk and mix well. Bring to a simmer, then add kasuri methi ( crushed between your palms) and salt to your taste. Cook covered for about 5-7 minutes, then stir well and add the paneer cubes. Add the yoghurt, followed by the garam masala and stir on low medium heat for 1-2 minutes and you are done! This entry was posted in Vegetarian and tagged palak, paneer, spinach on April 16, 2015 by rheena74. A quick note on beetroots. It can lower your blood pressure in just 24 hours! because it helps dilate blood vessels by the release of nitric oxide which dilates vessels. Super rich in iron, potassium and magnesium. So how much to take if you are a hypertensive, try with a glass a day ( 4oz), because however good, anything might be, I still believe in moderation. Rich in flavonoids and betacyanin which are anti oxidants to reduce your LDL and works as an anti inflammatory agent. Rich in silica which help calcium absorption. High in soluble fibre which helps with constipation. I saw this on a blog and wanted to try it cos it’s so healthy! Here goes…remember….weird but oh so healthy! And such a cheap root veg to get healthy! Steam the beetroot, let cool for 10 minutes, then add to your blender together with the soy milk, cranberries, banana and cocoa powder+ chopped chocolates. Blend till smooth and enjoy it chilled. p.s If you don’t quite enjoy the root taste of beets, try extracting the juice and then follow the recipe as above, but you’ll miss out on those fibres! This entry was posted in Vegetarian on April 10, 2015 by rheena74.